Tucked away in the ’burbs in what looks like a housing estate, Odika Lovina offers four excellent value smart modern rooms surrounding a great courtyard swimming pool. Average rating 7.6 from 122 reviews. A small group of two-bedroom family villas across the road are part of the same business, and guests staying here have access to the pool. The tiled bright white interiors are spotless, and funky design touches and accessories move the rooms up a notch from bland but clean to somewhere we’d be happy to hang out in. Beds are comfortable with quality linens and amenities in the air-con rooms include a flatscreen TV with DVD player, free WiFi, tea-making facilities, a safe, a desk and hanging space, but no minibar. Ensuite bathrooms are also smart and sparkling. A tiny furnished terrace is shared with the neighbouring room, divided by a screen. The small swimming pool takes almost the entire outdoor space, and you’d want to be careful you don’t fall in on the way to your room — not really suitable for young kids. We like the intimate atmosphere of the set up, but you will definitely get to know other guests — a perfect place for a group of friends. The family villas have similar interior styling, and include a living room and full kitchen, but lack the openness of an outdoor space, and seem a little claustrophobic. Unless you particularly want a kitchen and a private space, we’d book a couple of the guesthouse rooms instead. Breakfast is included in the rate. The friendly family who run the place live nearby and can offer local info or pick up a takeaway if you’re too lazy to walk to the restaurants. 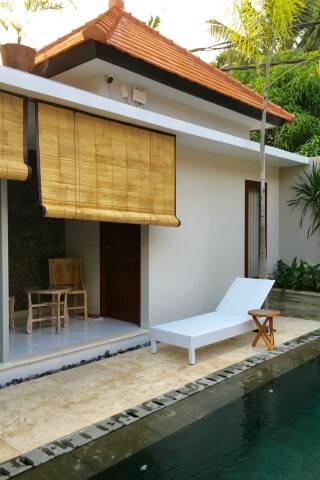 Odika Lovina is in a quiet location about 500 metres from the main road and another two kilometres to central Lovina. Not many locals know of its existence, so it’s a bit hard to find: turn off the main road into Jalan Cendrawasih, just east and opposite the turnoff to Melamun Hotel, Jalan Merak is to the left. Check rates at Odika Lovina on Booking.com.